Rob and I made it to Oslo last night after a long layover in Heathrow. Amazingly Terminal 5 has these incredibly comfortable black lounge chairs, so we both napped for a bit. Rob was completely zonked out while I kept setting alarms on my phone to make sure we didn’t miss our gate announcement. 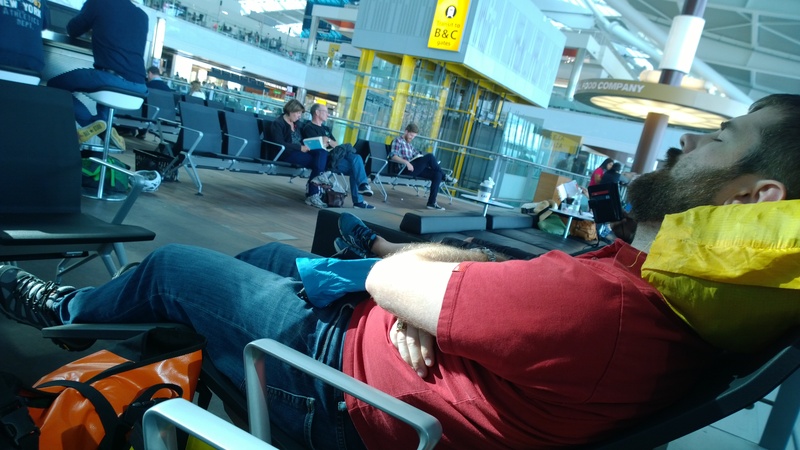 Rob catches a few Zzz during our 5 hour layover in Heathrow. Finally, after a bit of delay, we made it to Oslo. 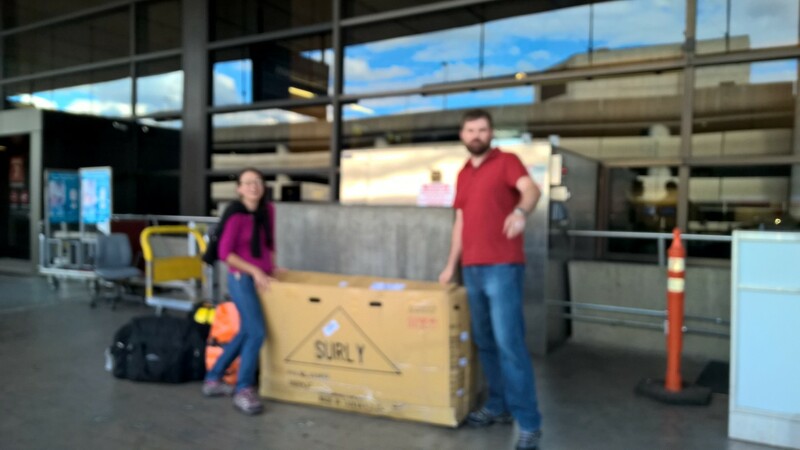 Our bag popped off the baggage claim right away, but the bike took another nerve-wracking 30 min or so. It was a huge relief to see our well-taped (Thanks TSA for resealing it well!) but slightly tattered franken-box slide down the conveyor belt (Hilariously they have a large conveyor belt for non-conveyable baggage). Navigating the bike box, heavy duffel bag and 4 bike bags from the baggage claim to the local train was a challenge. The express airport train takes 19 min to get to downtown Oslo, but cost 180 NOK/pp while the local train which runs slightly less frequently takes 25 min and is half the cost. Figuring out which local train to take required an extra few minutes before we thought to use HERE transit app from Nokia. It didn’t take long to find another Texan in Oslo. On the train platform, a professor from Texas State working a study-abroad program in Europe, was just beginning a weekend holiday in Oslo. We shared a good laugh over British Airways feature on Austin and its locals’ mispronunciation of certain street names. Then, we met up with some other Austinites in the Oslo train station. Rob’s parents return train from their Norway in a Nutshell overnight arrived 10 minutes after ours. They kindly helped us schlep our luggage to our hotel in the rain. Finally, a flat bed and several hours to sleep. Somehow Rob and I managed to pack up everything in the house, move a portion of it to the our friends’ house, clean the old house for the tenants and get to airport. Cheryl kindly dropped us off in our car since we had over 100 pounds of luggage. Hopefully we didn’t leave too many things in the house or forget anything essential. Somehow with moving there’s always so much stuff left at the end and trying to pack at the same time for a month vacation – I’m not sure exactly where everything went. Last night, we were making good progress with cleaning and packing. 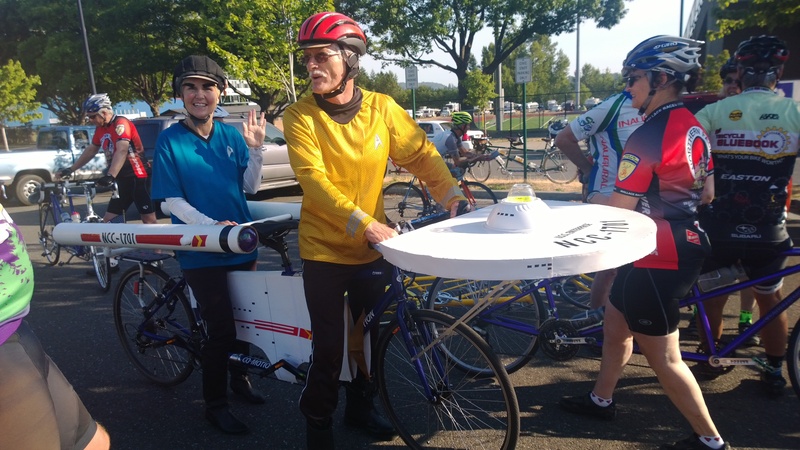 Rob got two bike boxes from Ride Bicycles and made a franken-bike box to fit the tandem halves. He only had to remove the pedals, seats and front wheel/fender to get everything to pack. This means he will be able to reassemble the bike, right? We’ll see when we get to Oslo. Despite having two panniers each as carry-ons, one massive bag and the bike box, we can kinda carry everything at once. Public transport is going to be a blast! See you all on the other side (of the ocean)! 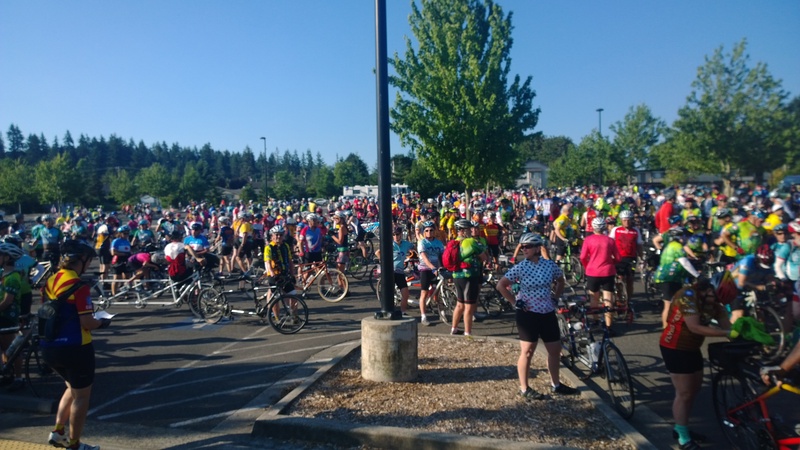 Rob and I had an awesome time at the 2015 Northwest Tandem Rally in Bellingham, WA. 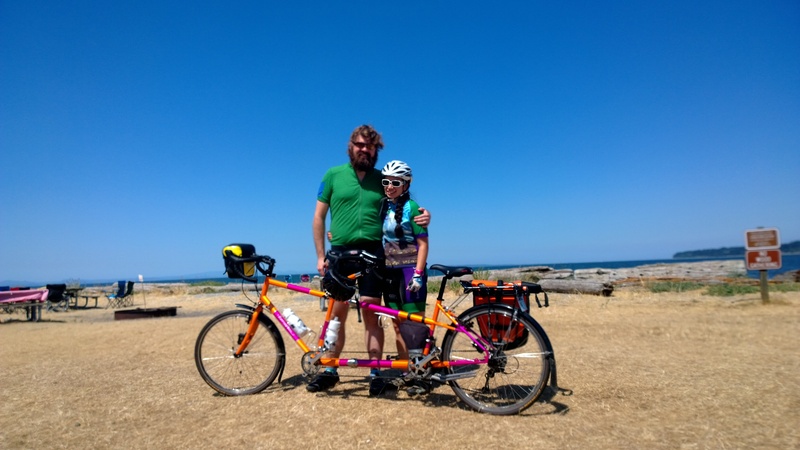 In addition to tacking on ~120 miles to our butts/legs, we acquired 4 more WABL passport stamps, visiting Aslan, Chuckanut, Boundary Bay and Kulshan Brewing. Hopefully, ETC can do as good a job when we host the rally in 2017. At Chuckanut Brewery. 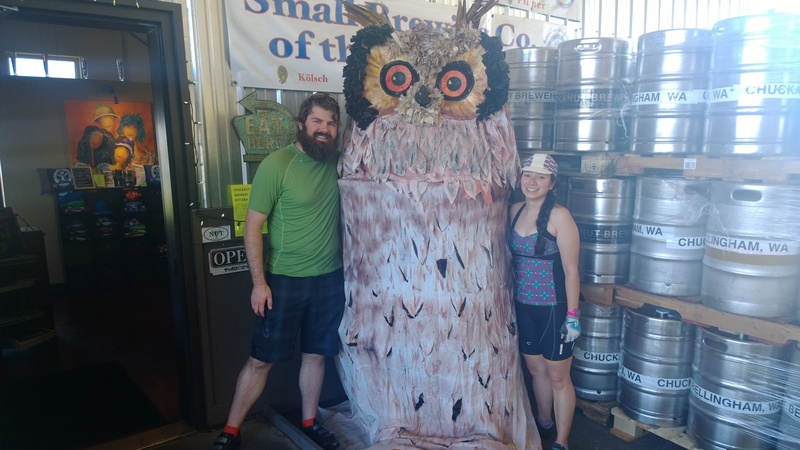 They had a large owl, so we had to get a pic with it.